For several years now, I've had the pleasure of playing intermittent but unusually thoughtful e-mail tag with David White, a VW reader who -- like more than a few of our readers, I'm proud to say -- makes a living in the creative arts. David, who is a playwright affiliated with the Passage Theater Company of Trenton, New Jersey, shares with me a special passion for French crime fantasy of the early 20th century -- the books about such characters as Arsène Lupin, Belfagor, Les Vampires, and of course, Fantômas -- and the films made about them and others by the likes of Louis Feuillade and Georges Franju. For much of our correspondence, David has expressed a desire to add a book of his own to this bat-wing of world fiction, and I'm happy to announce that his first novel, FANTOMAS IN AMERICA, has just been published by Black Coat Press (imprint of Jean-Marc and Randy Lofficier, authors of the indispensible McFarland reference work FRENCH SCIENCE FICTION FANTASY, HORROR AND PULP FICTION). It was added to Amazon.com today. 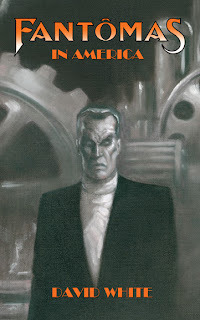 FANTOMAS IN AMERICA has the distinction of being the first new Fantômas novel to appear since the last of the Marcel Allain novels, FANTOMAS JOUE ET GAGNES ("Fantômas Gambles and Wins"), was serialized in French newspapers in 1938. Allain originally conceived the character with collaborator Pierre Souvestre, with whom he wrote no less than 32 lengthy adventures between February 1911 and September 1913. (And I think VW has a punishing schedule!) Souvestre was killed in the first World War, and Allain (who subsequently married Souvestre's widow) resumed the adventures of the "Genius of Crime" in 1925, writing only eight more novels between then and 1938 -- that, David tells me, lack the verve and imagination of the original classic 32. David's novel picks up in 1917, four years after Fantômas disappeared during the fateful cruise of the mega-ship Gigantic in the last Souvestre/Allain novel, LE FIN DU FANTOMAS? ("The End of Fantômas?")... and is partly based on FANTOMAS, a now-lost Fox Corporation film serial of 20 episodes directed by Edward Sedgwick, originally released in 1921. Some sources credit Boris Karloff among the production's supporting players, but this may be a mistake based on the resemblance of lead actor Edward Rosenman (who plays Fantômas) to Karloff in the print ads. David was able to learn about the obscure American serial by winning a rare pressbook on eBay, which provided chapter synopses for only a limited number of the film's chapters; thereafter, he was free to imagine the rest, which he managed to do by introducing as characters not only Sedgwick and Rosenman, but other characters from the silent screen such as D.W. Griffith's scrappy street gang of 1912, the Musketeers of Pig Alley. There are many other secreted pop cultural references too, including some more recent ones, but I'll leave the pleasure of discovering them to you. The book contains approximately 50 illustrations culled from the rare Fox Corp. pressbook, making FANTOMAS IN AMERICA as pertinent a non-fiction purchase for devotées of silent film fantasy as it surely is as a bold continuation of a wonderful literary tradition. VIDEO WATCHDOG has been on hold for the past couple of months while we attended to other business, but we're on the way back in a big way. We've just posted some contents info about VW 135 on the "Coming Soon" page of our website, which you can find here. I think it's a dandy, one of those rare issues where a lot of the material covered seemed to magically dovetail together in shared themes. If the list of titles under review in this issue seems a little light, that's because I've decided not to reveal everything about what's inside... so, this time, when we say "and much, much more! ", we really mean "and much, much more!" When you follow the link, be sure to click on the cover to access a free preview of a selection of interior pages! I've often said that what this world needs is a really good video representation of Mel Welles' LA ISLA DE LA MUERTE. Theatrically released by Allied Artists in 1967 as ISLAND OF THE DOOMED, the Spanish-Italian co-production is one of those all-too-common stories about a tourist bus that breaks down, forcing its varied and sometimes bickering passengers to knock on the door of an isolated villa -- isolated because the locals have all been frightened away by a "vampire legend." In this case, the villa is owned by the Baron von Weser (Cameron Mitchell), a crazed experimental botanist who -- in the course of breeding vegetables that taste like meat -- develops a carnivorous strain of Venus flytrap that requires a steady diet of human blood. Some viewers, remembering Welles' acting stint as Gravis Mushnik in Roger Corman's THE LITTLE SHOP OF HORRORS (1959), find the plant angle of interest; I, on the other hand, see this film as a little gem of the European co-production period of the 1960s, and one of the few titles that hasn't been available for viewing in its correct aspect ratio in 40 years. The film first came to my attention circa 1970, when it was presented by Cincinnati's The Cool Ghoul on WXIX-TV's SCREAM-IN under the TV syndication title MANEATER OF HYDRA. Even then, I was impressed by its creepy atmosphere, its effective set pieces, its cast -- Mitchell, Kai Fischer (a striking redhead whom I'd seen in UNCLE WAS A VAMPIRE), pretty Elisa Montés (providing a Mary Anne to Fischer's Ginger), and Riccardo Valle (Morpho in THE AWFUL DR. ORLOF) -- and a dubbing crew that prominently featured the recognizable voice of Anne Meara for the character of Myrtle. (The IMDb lists no screen credits for Meara between 1964 and 1970, making her a likely candidate for voice work.) I can also now recognize the voice of Rodd Dana issuing from the mouth of heroic lead Jorge Martín, if it's true -- as Welles told me himself -- that Dana provided the voice for Stephen Forsyth in HATCHET FOR THE HONEYMOON, a dubtrack that Welles directed in 1969. More impressive than the cast to my younger self was the movie's impressively gloopy special effects, which now look like a cheapish but plausible forerunner of some of the gloopy things Rob Bottin created for John Carpenter's THE THING (1982). The enticing music score, some of which sounds warbly here, if not faintly waterlogged, is by Antón García Abril, best-remembered today for scoring TOMBS OF THE BLIND DEAD. 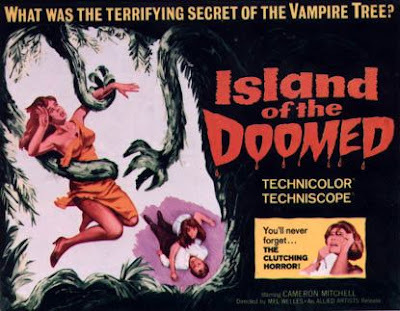 This quickly disappearing year marks the 40th anniversary of ISLAND OF THE DOOMED. We should be enjoying a DVD presentation that gives us the Techniscope picture in its true 2.35:1 framing, with crisp clarity and eye-popping color (in case anyone at Warner Bros., the film's most probable true owner, is listening). Alas, the only offer on the table is Shout Factory's "Elvira's Movie Macabre Double Feature" release (one of several), pairing the Mistress of the Dark's respective presentations of MANEATER OF HYDRA and Narciso Ibanez Serrador's THE HOUSE THAT SCREAMED [LA RESIDENCIA, 1971] -- on separate discs. Because I first saw MANEATER under the bat-like wing of a TV horror host, I like the option of being able to watch the movie without interruption or with the breaks featuring Elvira (Cassandra Peterson), every mention of whose name on the packaging is accompanied by a registered trademark (R). She must have great lawyers. If only the cinematic legacy of the late Mel Welles had fared so well in this Shout Factory venture. The Elvira (pardon the expression) bumpers extend the overall running time to 99m 57s and are retained from a 1983 MOVIE MACABRE broadcast from KHJ-TV, when the "B-movie queen's" disposition was more that of a sour Valley Girl than the bubbly double entendriste we know and love today. What's most infuriating about the presentation is that, if one watches the Elvira (R) footage, we see shots from the movie -- incorporated for comic purposes -- that are of markedly superior quality! Still cropped, of course, but crisper and more colorful. Clearly, this was the version shown in tandem with the Elvira (R) footage, so why wasn't THAT source used? 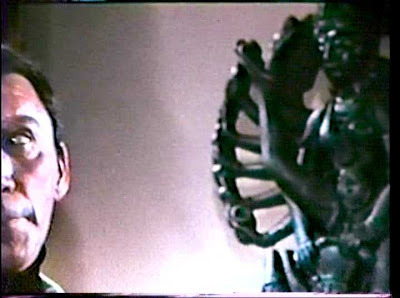 I haven't as yet watched THE HOUSE THAT SCREAMED -- a better picture than MANEATER OF HYDRA, frankly -- because I know I'm bound to be disappointed by the quality. The presentation of MANEATER OF HYDRA (which our "hostess with the mostest" repeatedly calls "Maneater of Heedra") is so crummy, in fact, it's the first time I've ever watched this film and wondered what I ever saw in it. Obviously, a quality that this presentation has literally reduced to nothing. The most exciting news of the day comes from fellow publisher-editor Gary J. Svehla, who tells us that my MARIO BAVA ALL THE COLORS OF THE DARK is featured in the current issue of PASTE, the music and pop culture magazine, on their list of the Best Books of 2007 -- right next to the new Harry Potter book! I don't know how it came to their attention, but I'm grateful. The response to the Bava book in print is just beginning to get underway. MJ Simpson wrote an excellent review and author profile for the current issue of the British magazine DEATH RAY, and I know that feature articles and reviews are forthcoming in RUE MORGUE and FANGORIA. My fingers are already crossed for some kind of Bava book mention in THE NEW YORK TIMES' Best Books of 2007 issue -- even to receive mention as one of the Honorables would be wonderful. 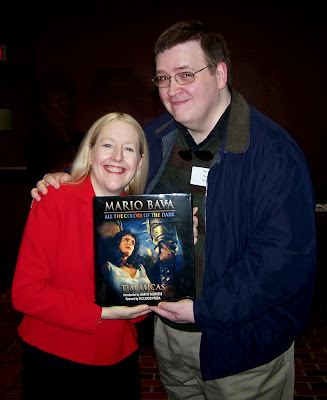 On his MYRANT blog, Steve Bissette has announced that he recently finished reading "the truly massive, moving" Bava book and promises to write at length about the experience soon. 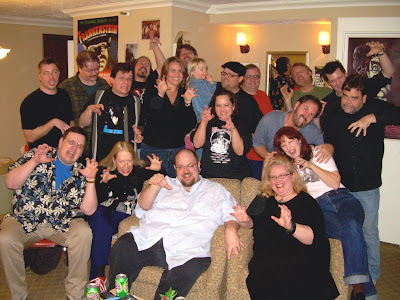 Also, all seven segments of Colin Reboy's interview with Donna and me -- the complete novel for television, as they used to say -- are now posted at the Studio Kaiju site. And what of the reclusive fellow behind this blitzkrieg of publicity? I am presently running a VW gauntlet that's likely to keep me busy up till the last pre-holiday moment, which is why Video WatchBlog activity has been so irregular of late. We've just completed work on VW #135 (one of our best, if I do say so myself); the principal features are my "DVD Spotlight" on PAN'S LABYRINTH and Mark F. Berry's fine interview with English actress Judi Bowker (CLASH OF THE TITANS, COUNT DRACULA), but fuller contents information will be posted on our website in the coming days. We are going right into VW #136, our GRINDHOUSE issue, which is pretty much complete and ready for editing and layout; and Donna is pressing for us to jump into VW #137 as soon as we finish the previous one. Of course, the first thing she's going to ask me when that time rolls around is "Where are your reviews for this issue?" -- but I've been working on two other issues of the magazine (including writing some emergency material for them), so when have I had time to watch movies, much less review any? This sort of frenzied pace may suit Roger Corman, but it doesn't suit me. We've been doing this for seventeen years now; for once, I would like to take a more leisurely and receptive approach to the Christmas season. I want to send cards, telephone neglected friends, do some actual in-store shopping, and so forth -- but it doesn't seem too likely. It's just as well I find myself on a Ramones binge these days; I need the energy. Reg Park, who passed away yesterday after a long struggle with cancer at the age of 79, was first and foremost a world champion bodybuilder, but his brief and all-but-accidental acting career in the 1960s brought to the screen the most fully realized portrayals of Hercules ever filmed. He followed in the footsteps of Steve Reeves (the first man ever to hold all three major titles of accomplishment in bodybuilding: Mr. America, Mr. World and Mr. Universe), who made the role world-famous in the enormously successful HERCULES (1957) and HERCULES UNCHAINED (1958). When Galatea producer Lionello Santi sold the franchise to producer Achille Piazzi, Reeves -- out of loyalty to director Pietro Francisci, who had cast him -- abandoned the role, which was briefly taken up by Mark Forest (the screen name of Lou Degni). When Forest was lured away to take over the role of Maciste in a multi-picture deal, Piazzi offered Hercules to Reg Park. A former Mr. Britain and two-time winner of the Mr. Universe title, Park was British-born but based in South Africa, where he ran a successful health club. Once Park was convinced that Piazzi's offer was sincere, he flew to Rome -- without any prior acting experience -- to star in HERCULES CONQUERS ATLANTIS (aka HERCULES AND THE CAPTIVE WOMEN, 1961), directed by Vittorio Cottafavi. Assisting Cottafavi on that picture was an uncredited Mario Bava, who devised some special effects sequences and contributed some second unit photography. Park had a great time being the center of attention and was well-liked by the crew -- not something that could always be said of Reeves -- and he was convinced to stick around and make a second picture that Mario Bava and some screenwriter friends had cooked up in the meantime. That project became HERCULES IN THE HAUNTED WORLD (aka HERCULES IN THE CENTER OF THE EARTH, 1962). Steve Reeves was the most convincingly godly of all the actors who took on the role of Hercules and, in a sense, he was an impossible act to follow, though his acting was often wooden. Reeves' experience was in posing; he looked great onscreen, knew how to stand so that the light caught his oiled physique in ways that would flatter him, but he was not an effective speaker. Reg Park, on the other hand, was more than a bodybuilder; he was also an entrepreneur, and his past experience in self-promotion and salesmanship brought to his acting jobs a sense of relaxed, good-humored ease that made him the most fully dimensional of all the actors ever to play the part. Park also had the good fortune to work with Cottafavi and Bava, whose directorial abilities went well beyond the fanciful costumed fun that was Francisci's stock in trade. Cottafavi's Hercules, in particular -- lazy, self-absorbed, fun-loving, self-mocking, all too human until various challenges provoke him to rise to the occasion -- is the closest of all movie Hercules to the one that originated in the pages of Greek and Roman mythology. Bava, who preferred female leads, explored the character's vulnerability in his film, as he ventures into the depths of Hades in an effort to save a few loved ones who, by way of black magic, have either turned against him or oblivious to him. HERCULES IN THE HAUNTED WORLD is a masterful fusion of the epic and horror genres, just as Bava's PLANET OF THE VAMPIRES is an ideal fusion of horror and science fiction; it is also the most purely cinematic example of the sword-and-sandal genre, and the greatest showcase Bava ever found for his unique ability to conjure fabulous imaginary worlds with next to no means. HERCULES CONQUERS ATLANTIS, on the other hand, is held by many devotées to be the absolute finest of all the Italian sword-and-sandal films. These are also the films that Arnold Schwarzenegger credits with inspiring his own desire to pursue a career in bodybuilding. Reg Park was his hero. Park made only three other, lesser films before returning to the business he had founded in Sandton, South Africa. One, and one of them (HERCULES THE AVENGER aka SFIDA DEI GIGANTI (1965) was cobbled together in large part from footage recycled from the films he had made with Bava and Cottafavi. Some years ago, I exchanged a couple of e-mails with Reg Park. I had tracked down the website for his business and e-mailed him there, asking him to be interviewed for MARIO BAVA ALL THE COLORS OF THE DARK. He responded kindly and warmly, but begged off, explaining that his work on those pictures was done so long ago, a lifetime ago, and he could no longer trust the validity of his own recollections, vague as they were. If he couldn't be certain of their veracity, he preferred not to entrust them to posterity -- but he wished me the very best of luck with my project. I admired the integrity of that response much as I had always admired the integrity of character so evident in his screen portrayals. If only all actors with hazy memories would admit to it, and not misinform history with their self-serving "entertainments" and "legends"! Fortunately, I found some quotes from earlier published interviews, so I was able to represent his view of things in the book somewhat, and I'm very glad about that. Especially now. To see the supreme likes of Reg Park and Gordon Scott vanish from the earth in the space of a year makes me feel a sense of loss that goes beyond the personal; one feels that a certain kind of man, an irreplaceable kind, is disappearing from our midst. We used to call them heroes. Today we need heroes more than ever, but all that the movies give us anymore are actors who play heroes, usually of the conflicted or traumatized kind; they play them in costumes that lend their bodies phony musculature, they perform their heroic acts with the assistance of CGI, and they explore their "dark sides." Anyone can play Batman or Spider-man, but a role like Hercules cannot merely be played; it must first be earned -- by dedicating years of one's life to the attainment of a superior level of physical perfection and physical strength. If someone like Reg Park climbed a colossal tree, or traversed a length of rope suspended over a lava pit in a matinee movie, it didn't matter that the scenes and deeds were staged because he, himself, was real. Put the real Reg Park in those same situations and he would have stood a better chance than most of pulling it off. His Hercules walked among us, not above us. You had to admire him... but he also made you like him. I may have discovered the key to his likability one night while watching parts of HERCULES IN THE HAUNTED WORLD with the sound turned off. (This is something I occasionally do to gauge how much is being brought to a piece of filmmaking by its soundtrack.) Having grown somewhat adept at lip-reading, I noticed that, in all of the scenes where Hercules raised his massive arms to the sky and addressed his father Zeus, Reg Park -- on the set -- had addressed his lines to his own Heavenly Father: Jesus. Needless to say, the literary Hercules predated Christ by centuries so the chronology of Park's spoken words is laughable, but surely he knew that his dialogue was going to be looped by someone else later, and the line would be fixed. What mattered to him in that moment, it seems to me, was to make the moment believable and not dishonor the part. I wish I could have asked Reg Park about this, but I suppose the work stands as its own best explanation. When you look at these scenes, you believe them in a way that wholly transcends the way Steve Reeves used to bark "By the Gods!" at the arc lights off-camera. A moment of silence, then, for the gentleman who brought Olympus down to earth. I stumbled onto this homemade cartoon at YouTube and had to share it with you, though it's more appropriate to Halloween than Thanksgiving. Never mind that; you'll be thankful for the link. The piece is uncredited but I think it's an absolutely wonderful idea and, remarkably, executed to nearly the point of perfection, though I'd be surprised if more than one person was involved in its creation. If it was more polished than this, it would likely lose some of its charm, just as the music would, had it incorporated more than a few chords. I'm telling you, if something like this was on one of the cartoon networks, in a program akin to the old Al Brodax-produced Beatles cartoons, I would watch it religiously every day -- and I bet at least half of young America would, too. Wonderfest Reunion 2007. Front L to R: Me, Donna, Chris & Lisa Herzog, Linda Wylie. Rear L to R: Jeffrey Nelson, Gary Prange, Randy Fox, Troy Guinn, Janet Conover, John Davis, Allie Conover, Carrie Galloway, Dave Conover, Tom Weaver (as himself), Tim Keegan, Harry Hatter, Ethan Black, Donnie Waddell. Photo by the incomparable Joe Busam. Donna and I spent a terrific weekend with beloved and kindred spirits in Louisville, Kentucky, where we participated in the first-ever, under-the-radar WonderFest Reunion. Last May, it was expressed by several of us that it was going to be a long wait till we all saw one another at the next Wonderfest in July 2008, so Gary Prange and Donnie Waddell arranged for a sooner get-together to happen. No exhibits, no banquets, no guest stars, no Rondo Award ceremonies, and no karaoke... but the same hotel and, thanks to the management of the Executive West Hotel, Gary and Donnie were able to play host to us all in the very same suite where the Old Dark Clubhouse was held at the previous Wonderfest in late May. Lots of great up-till-the-wee-hours conversation, interesting screenings from both DVD-R and 16mm, a side trip to an antique toy mall, a trivia contest, etc. Six of us broke away from the carnivorous majority on Saturday night to have what turned out to be the greatest sushi experience of our lives. I've eaten sushi in Cincinnati, Newport, Toronto, Los Angeles and San Francisco, but the very best I've ever had, bar none, was at Sapporo Japanese Grill and Sushi on Bardstown Road in Louisville, Kentucky. (I particularly recommend the VIP and Godzilla rolls.) I am now nursing a serious fantasy about moving to the Bardstown Road area now -- and not just for the sushi; it seemed like a great, vibrant, little community with lots of interesting shops, restaurants, and people. My "No Zone" column review of Criterion's BREATHLESS [A bout de souffle, 1959] is now available for reading here at the SIGHT & SOUND website. It's also featured in the current issue. There are now four more additions to the Studio Kaiju webcam interview with Donna and me, which can be found with the earlier two here. The Reboy family are now titling the segments so that interested viewers can preview the topics of discussion. Donna and I had an amazing morning as we were interviewed about the Bava book, via webcam, for attendees of the Trieste Science Fiction Film Festival. The event was organized by Martina Palaskov Begov and (Bava book research associate) Lorenzo Codelli with Lamberto Bava, Joe Dante (who's receiving a Lifetime Achievement Award this evening), and critics Kim Newman and Alan Jones in attendance. There were a few worrisome glitches in the connection at first, but in the end it came off very well, and there seemed to be a sizeable turnout for this legitimately science fictional event. (Joe said that the webcam hook-up made him feel like a character in PLANET OF THE VAMPIRES.) It was a moving occasion for Lamberto and for me, but there was also lots of laughter and some wonderful kudos from the folks on the dais. Our warm thanks to Martina and Lorenzo for realizing this important occasion for us. We successfully recorded the event by training our camcorder on a second computer screen -- the widescreen picture is strangely cropped at times, but it's all there. Once the footage is edited, probably sometime next week, we'll find a way of making it available to you online. In the meantime, Part 2 of Colin Reboy's Studio Kaiju webcam interview with us (our first!) is now available for viewing on their "Ink" page. Follow the link to "Ink" by clicking here. Last week I had the pleasure of attending a preview screening of Todd Haynes' I'M NOT THERE, which has been broadly described as a movie about the many public faces of Bob Dylan. As I've mentioned on this blog before, having always admired Dylan in a sort of half-committed, half-hearing way, earlier this year I set myself the task of learning more about him, throwing myself into a mountain of extracurricular reading (Marcus, Williams, Heylin, et al) and a study of his collected recordings, released and unreleased. So I went into the screening with the feeling of moving toward a graduation, that much of my previous year had been a preparation for this occasion. Considering the profound pleasures I've come to know by opening my heart a little wider to Dylan's music, and my mind to the best writing currently in print about it, it would be hard for any film to live up to that kind of "opening act," but to get anywhere near a proper appreciation of I'M NOT THERE, some kind of preliminary immersion is helpful. Otherwise, "Ballad of a Thin Man" might just as well be aimed at you. I'M NOT THERE is a rumination on the many public faces of Bob Dylan only on its rambling, rustic, picaresque, picturesque surface. It does indeed cast six different actors as shades of Dylan -- Marcus Carl Franklin as Woody, an African-American child who steals rides in boxcars while toting his guitar in a case marked "This Machine Kills Fascists"; Christian Bale as Jack Rollins, a brooding protest singer who eventually withdraws from the music business to become an actor and, later, to embrace Christianity as Brother Jack, the pastor of a pentacostal church in California; Ben Whishaw as Arthur Rimbaud, a poetically minded commentator on the stories; Cate Blanchett as Jude, whose band turns a battery of machine guns on the crowd at the Newport Folk Festival and vaults into the headier heights of pop celebrity; Heath Ledger as Robbie, an actor whose career and womanizing contribute to the breakdown of his marriage to Claire (Charlotte Gainsbourg), a painter; and Richard Gere as Billy, a middle-aged recluse in a rustic town outside of nowhere, whose need for privacy is disrupted by political wrongdoing that cries out for someone to rally the opposition. These various facets of Dylan (or Dylanesque) blend in and out of one another as the film plays, and we feel like we're watching a river flow. To go into the movie expecting some kind of statement or portrayal of Dylan is to be misled, because there's quite a lot about all of these characters that isn't consistent with the real Dylan, so, we come to realize, the point must be something else. I've liked all of Haynes' films but have come away from all of them, save SUPERSTAR, feeling that something was broken about them, something related to casting. I can't tell if Haynes is simply too distracted to bring focus to the task, or if (being an independent American filmmaker -- try counting all the production companies attached to this movie) he simply uses the biggest names he can attract, regardless of how right or wrong they may be for the part, and fills up the rest of the roles with whoever is good, available, or affordable. This problem (as I see it, anyway) is also present here, especially in the sections concerning Ledger and Gainsbourg. Both actors are very good, but wrong enough in the landscape to make its inviting haziness seem merely blurry and the most committed viewer feel confused and restless. Most viewers are grabbing onto Cate Blanchett's Jude (a hot Oscar contender, they say) like a rock in a raging flood because it's the most recognizable Dylan persona in this celluloid carnivál, being as much an impression of the Dylan of DON'T LOOK BACK as a performance. She's a wonderful gender-bending addition to the movie, and a heroic casting feather for Haynes' cap, but she's a King (or Queen) in the deck rather than an Ace -- close enough to someone real for us to know how close she isn't. The reason for any actor to play any living character is to summon forth and concentrate an emotional truth about that person in one scene of drama that might not be present in many hours of documentary footage, which is why I feel Blanchett ultimately gives us caricature rather than character. At one point, she covers her face in fretful agony -- a studied lift of footage cut from EAT THE DOCUMENT in which Dylan, sitting in the back of a taxi with John Lennon, struggles to marshal the nausea brought on by narcotic indulgence. When I saw the original (which can be found on YouTube), I felt great empathy for Dylan, surrounded by sniggering idiots as he pleads with unwise circumstance to put him back on a safe road to home, but the more one knows about this stuff, the more Blanchett's gesture offers footnote in place of emotion. My favorite of all the proto- or semi-Dylans herein is Marcus Carl Franklin's Woody, who does his own singing and playing and contributes to a wonderful porchfront performance of "Tombstone Blues" with Richie Havens. Somehow the triumph of a woman portraying a man doesn't seem all that transcendent when compared to what Franklin does, taking us back to the young Bobby Zimmerman who modelled himself on folk troubadour Woody Guthrie and left his home in Hibbing, Minnesota to seek his fortune. In what may be the movie's most wondrous moment, young Woody is knocked off a boxcar as it crosses a bridge and plummets into a river where he's swallowed whole by Monstro the Whale, or shall we say (in deference to Disney lawyers) his reasonable facsimile. Haynes has said that he made this movie in response to his own exploration of Dylan's work, which in retrospect he realized was a subconscious preamble to making a needed change in his own life. As a fellow Dylan student, I award him only the highest marks for the choices he made in terms of song selection. Haynes managed to include almost all of my favorites (surely "Everything is Broken" belonged in here somewhere), but the sequence accompanied by "Blind Willie McTell" (one of Dylan's most magnificent yet obscure songs), which includes young Woody playing a song that rouses a comatose Woody Guthrie in his hospital bed, is almost unbearably poignant. There's a two-disc soundtrack for this movie out now, consisting almost entirely of cover versions of Dylan songs, but a good deal of it isn't heard in the film, some of the covers heard in the movie (like "The Ballad of Hollis Brown" by Iggy and the Stooges) aren't on the soundtrack album, and some album covers (like Cat Power's fine "Stuck Outside of Mobile with the Memphis Blues Again") are replaced in the film by Dylan's originals. The mercurial nature of all this is only too appropriate, and the soundtrack -- Sufjan Stevens' absolutely horrible reading of "Ring Them Bells" notwithstanding -- is as fine a tribute album as one could reasonably wish. Included on the album is the first official release of "I'm Not There," a much-bootlegged song dating from the "Basement Tapes" recordings of 1967, which Dylan followers (you'd have to be one to have heard it before now) generally hold to be one of his most moving compositions and performances despite it being obviously only half-written or improvised on the spot. It's presented in a weird bifurcated stereo mix that consigns Dylan's woeful voice to the right channel, allowing Garth Hudson's organ to swell to equal volume on the left, making the performance more of a battle than it should be. (Stick to the bootleg mono version.) There is also a cover version by Sonic Youth that captures something of the original's shambolic quality while lacking its gripping air of trauma and tenderness. Perhaps the best I can say about I'M NOT THERE is that I left the theater feeling deeply enriched by an uncommon experience, a technique one would not be wrong to call virtuosic, and a helpful message that I wasn't expecting; this, and that there isn't anything imperfect about it that cannot also honestly be said of Dylan's own body of work. Don't go expecting a clear-cut or even linear experience. Go with the flow and try to compare what you're seeing to a poem, an essay, or a dream; that'll get you there faster. But that's not really the best I can say -- which is that, even though I wasn't 100% satisfied by I'M NOT THERE, I have no doubt that it's a friend for life and the best film of the year because its depth, its beauty, its ambition, even its flaws stuck to my ribs, reassuring me that cinema isn't dead yet (it's only bleeding). I'M NOT THERE opens around the USA on November 21, in Canada on November 28, and in Europe next month. Last Sunday, Donna and I were interviewed by Colin Reboy of studiokaiju.net through the modern miracle of webcam. Colin (a precocious 8th grader) and his parents, Judy and Joe Reboy, have just added a new department to their website, called "Ink," which will focus on interviewees who (as Joe aptly puts it) "work in non-volatile information formats such as books, magazines and canvas." Our interview, which ran for about half an hour, is being used to inaugurate this new department. The Reboys plan to publish the interview in three or four 8-10-minute segments, the first of which is now available for viewing here. We talk about all kinds of things, mostly about VIDEO WATCHDOG and its editorial interests and policies, in passing about the Bava book, and also about movies in general and my viewing habits. I got a real kick out of watching this first segment; it looks like Colin is communicating with a couple of characters out of Pupi Avati's ZEDER. Donna and I pose with the kid at the 2007 Ohioana reception at the Cincinnati Public Library, November 11. Photo by Scott Belmer. It's a busy time with not much time available for blogging. The promotional demands attending the release of the Bava book continue, and now we're busily preparing two issues of VW back-to-back, with another looming just after Thanksgiving. Last Sunday, Donna and I attended the Ohioana reception at the downtown Cincinnati Public Library, where a few dozen local writers with books out this year (including me) were fêted in a slide show presentation, summoned before the audience, and presented with certificates of achievement. I was a bit nervous until the program was well underway because I assumed that we writers would be called upon to speak (as we were when I attended one of these after the publication of THROAT SPROCKETS back in 1994); I hadn't had time to prepare any notes, but fortunately no public speaking was required. Lilias Folan, the pioneering yoga broadcaster, was there looking my age (she was a grown-up on television when I was still a tyke), but I missed my chance to meet her. The great pleasure of the morning was meeting fellow writer Scott "Belmo" Belmer, who's based in Fort Mitchell, Kentucky. Belmo and his wife Terri were there in recognition of books he had published this year about, respectively, Buddhist monks in exile and Beatles tribute/parody albums. We traded contact information and seemed to have things in common. After Ohioana, we came back home to do our first webcam interview, about which I'll say more once it's available for viewing online. This coming Friday morning, we'll be doing our second webcam interview, which is tremendously exciting. For this one, Donna and I will be interviewed about the Bava book on a large projection screen in an auditorium at the Trieste Science Fiction Film Festival, and I understand that Lamberto Bava, critics Lorenzo Codelli and Alan Jones, and possibly Joe Dante will be present to speak to us and add to the discussion. I've known Lamberto and Lorenzo for more than 30 years, entirely by correspondence and telephone -- we've never met -- and it makes me tremble a bit to knowing that I'll soon be speaking to them face-to-face. Fortunately I know Joe and Alan pretty well, so having them there should help to keep me emotionally anchored for the hour. I just finished writing my "Barks" editorial for VW 135, so -- except for my final read-through -- my work on it is done. Then it's on to 136, which I'm hopeful of at least editing by Friday. Thursday, actually. Is it possible? We'll see. From the main titles of FRANKENSTEIN'S CASTLE OF FREAKS (1974). Guess Who's Day It Is? That's right: The cutiful and charmbling publisher of VIDEO WATCHDOG, gifted designer of MARIO BAVA ALL THE COLORS OF THE DARK, that friendly voice on the telephone, sworn enemy of all Big Business weasels, the hardest working woman in film fandom, computer genius, quilter extraordinaire, Monkees connoisseur, Oz collector, Hoops and Yoyo fan, Titanic devotée, den mother of the Old Dark Clubhouse at Wonderfest, mother to three cats, enabler of all my dreams, dedicatee of my two novels and THE VIDEO WATCHDOG BOOK, the best friend anyone could ever have (many will support me in this) and my beloved wif (no, I didn't forget the "e") -- Donna Marie Goldschmidt Lucas -- was born on this day [cough, cough] years ago! As Bobby wrote and Ricky sang, "Bow down to her on Sunday, salute her when her birthday comes..."
And that seems just about the right thing to do. 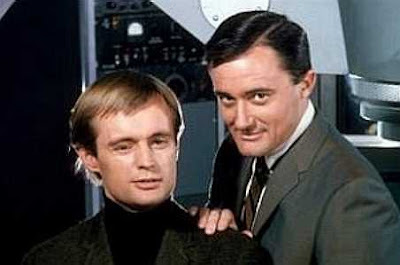 David McCallum and Robert Vaughn as Illya Kuryakin and Napoleon Solo, the Men from U.N.C.L.E. At the risk of making you think this is TCM Week here at Video WatchBlog, I feel it's my responsibility to report that Turner Classic Movies is devoting tomorrow morning and afternoon to a complete retrospective of MAN FROM U.N.C.L.E. movies. Yes, it's true that the entire series is coming out later this month on DVD, but there are reasons why you should watch/record at least some of these, because the "whole enchilada" box set isn't quite as whole as you might think. Here's a breakdown of the features TCM is showing, complete with eastern time zone showtimes, with some helpful annotations. I've asterisked (*) the ones of particular import. * 6:00 TO TRAP A SPY - This is a color feature-length expansion of the series' first episode, "The Vulcan Affair," which was telecast in black-and-white. And the episode included in the series box set will likewise be cut down from this longer version and in black-and-white. Featuring William Marshall, Pat Crowley, and Fritz Weaver. Directed by Don Medford, who helmed "The Judgment," the history-making final two-parter of THE FUGITIVE. 7:45 ONE OF OUR SPIES IS MISSING - Adapted from the Season Two two-parter, "The Bridge of Lions Affair," guest-starring Vera Miles and Maurice Evans. Directed by E. Darrell Hallenbeck, a veteran of TV's THE TWILIGHT ZONE. * 9:30 ONE SPY TOO MANY - Don't miss this feature-length edit of Season Two's two-part opener "The Alexander the Great Affair," featuring Rip Torn. Many fans regard this "affair" as the series' highpoint; it's certainly one of them, and Gerald Fried's score is the most infectiously rocking the program ever had. Directed by Joseph (COLOSSUS: THE FORBIN PROJECT) Sargent. * 11:15 THE SPY WITH MY FACE - Color expansion of Season 1, Episode 8: "The Double Affair," featuring Senta Berger, another episode telecast only in black-and-white. Directed by John (ONE STEP BEYOND) Newland. 12:45 THE KARATE KILLERS - Composite of the Season Three two-parter "The Five Daughters Affair," which sports one of the finest casts the show ever assembled: Joan Crawford, Telly Salavas, Herbert Lom, Curd Jurgens, Terry-Thomas, Kim Darby and Diane McBain. Directed by Barry (WILD IN THE STREETS) Shear. 2:30 THE SPY IN THE GREEN HAT - Feature-length composite of the Season Three two-parter "The Concrete Overcoat Affair," starring Janet Leigh and THE GIRL WHO KNEW TOO MUCH star Leticia Roman. Also directed by Joseph Sargent. 4:15 The HELICOPTER SPIES - Consolidation of Season Four's "The Prince of Darkness Affair" two-parter, featuring Carol Lynley, Bradford Dillmann, and Lola Albright. Directed by Boris (THE OMEGA MAN) Sagal. 6:00 HOW TO STEAL THE WORLD - Feature version of the two-parter that closed the series, "The Seven Wonders of the World Affair," guest-starring Barry Sullivan, Leslie Nielsen, and Eleanor Parker. Directed by Sutton (CHOSEN SURVIVORS) Roley. Labels: The Man from U.N.C.L.E. Terence Fisher's FRANKENSTEIN CREATED WOMAN (1967) had its HD premiere last night on Monsters HD. I've seen the movie countless times over the years, as I have all of the Hammer Frankenstein films starring Peter Cushing. I've always liked it, but have always harbored an odd ambivalence about the place it occupies in the series; sometimes it's up, sometimes it's down in my estimation. I tend to agree with David Pirie's assessment (in A HERITAGE OF HORROR) that it's the most poetical and successfully metaphysical of the series, and it contains arguably the most understated finale anyone will ever find in the genre, but there is a lingering feeling that it is ill-served by some rough edges and narrative obliqueness. Seeing the film in HD certainly raised it in my estimation, as also happened when I saw Hammer's EVIL OF FRANKENSTEIN (1964) in high definition a couple of years ago on Universal HD. Seen in HD, FRANKENSTEIN CREATED WOMAN becomes a far slyer, more tactile film and not without purpose. 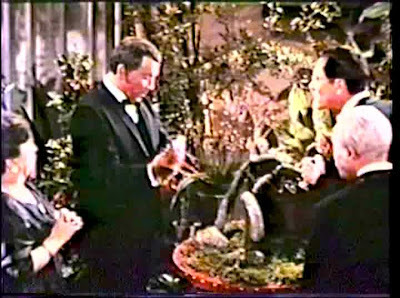 For example, all of the wine poured in the movie (apart from the Baron's celebratory champagne) is a very thin, transparent red -- unconvincing, like cherry Kool-Aid. I made a note to myself every time it appeared onscreen: "Looks fake, I shouldn't be noticing that." However, when Karl (KISS OF THE VAMPIRE's Barry Norman) -- the second of the young pre-A CLOCKWORK ORANGE thugs -- is sitting in the tavern, rattled by the murder of his friend, he hears the ghostly voice of Hans (Robert Morris, for whose guillotine death he was partly responsible) and nervously knocks over a glass of the same pale red wine positioned in front of him... and there's a change of camera angle as the wine flows out of the glass over the white tablecloth and looks unmistakably as thick and red as blood, the Kool-Aid having been replaced with what looks like real wine, perhaps mixed with a bit of Kensington Gore! I don't think it was Fisher's intention that I be distracted by the unconvincing wine earlier in the film, but by making those earlier glasses and decanters of wine look so watery, this shock cut more pointedly communicates the idea that blood will soon be spilled. And consequently, we no longer have to see that blood spilled when it is. The image has been planted; we can supply the rest. The killing of Karl -- which shows Christina (Susan Denberg) emerging from the backroom of the tavern with a cleaver, Karl falling to the floor, and the downswing of the cleaver cutting to Christina chopping wood -- has always looked in deteriorated quality compared to the surrounding footage, and it's like that in the HD presentation as well. What I don't know is whether the original negative of this footage was somehow lost and so had to be recreated from a coarser element, or if the change in quality was done for more, shall we say, Brechtian purposes -- to add to our sense of disturbance about the scene by altering the look of the image in unexpected fashion. There are also scenes early on, when Hans first visits Christina's bedroom, for example, where the pinecone-shaped spears of her bedposts occupy a compositional focus. Hans actually caresses one of these and scratches at it absent-mindedly while talking to the girl he loves, subtly drawing our attention to it. The camera dwells on these ornamental spears again when Anton, the leader of the thugs, is led there by the remade/remodeled Christina. And it wasn't until seeing this HD version that I ever noticed this thread, or that one of the movie's key shocks -- the revelation that Christina has stolen Hans' severed head from its burial place and mounted it on a similar spear-like protrusion atop a decorative mirror, in order to converse with it -- was, in effect, its pay-off. It's this sort of delicate mastery, this ability to lead the eye by the nose (so to speak) that is the essence of Terence Fisher's genius; this, and also his profound interest in people. Seeing the film again, I was struck with admiration for the way the film delved into the lives of its characters, not only into their superficial relationships but also into their social classes, their aspirations, the causes for their inclinations toward good and evil, and also their psychological motivations. 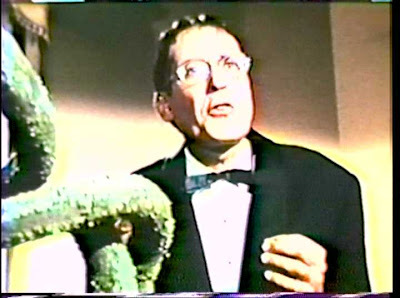 And, also for the first time, I understood the essence of that dumbfoundingly abrupt ending, which is dumbfounding precisely because it is true to the essence of the main surviving character: Baron Frankenstein himself (Peter Cushing). What engages us about this film and its story is precisely its human element, and it is this element for which Frankenstein has neither time nor appreciation. When Christina requests a mirror following her miraculous restorative surgery, the Baron refuses it, having no concept of the young woman's starvation for any kind of vanity; he tells her that she doesn't need the mirror because she has his word that the scar tissue has healed perfectly and goes back to the work that separates him from all human contact and understanding. It is left to his "muddle-head" assistant Dr. Hertz (Thorley Walters) to bring her the mirror, to dote on her, to kiss her like a grandfather -- to do all the things essential to a child's well-being that Frankenstein himself has been blinded to by his work. He's a great man, as Dr. Hertz takes care to tell her, but, as he fails to say, he's also a miserable human being. When the film ends with his work once again in failure, it fails this time because there is something in the shattered, duplex, human element of Christina (who contains her own soul as well as that of her dead lover) that cannot permit it to succeed. The finale has no resonance because Frankenstein cannot understand what has happened and is unwilling/unable to bend to that human understanding; all he can do is shrug his shoulders and return to his drawing board. This is the first premonition the series gives us of the character's final downfall in FRANKENSTEIN AND THE MONSTER FROM HELL (1974). His projects are doomed to failure because he is, himself, only the shell of a man without the soul. Attention, Turner Classic Movies subscribers! Tomorrow -- Monday, November 5 -- TCM will be running five movies in Columbia's classic B-movie mystery series "The Whistler" between 6:00am and 1:30pm eastern time. If you've never seen them, you don't want to miss them; if you have seen them, you'll want to get your video recorders up and running, because there's no indication yet that these gripping noir confections are destined for an official release. The films in question are THE WHISTLER (1944, directed by William Castle) at 6:00am; THE POWER OF THE WHISTLER (1945, directed by Lew Landers and based on Cornell Woolrich's novel THE BLACK CURTAIN) at 7:15am; THE VOICE OF THE WHISTLER (1945, directed by Castle) at 8:30am; THE MYSTERIOUS INTRUDER (1946, also directed by Castle) at 9:45am; THE SECRET OF THE WHISTLER (1946, directed by George THE RETURN OF DR. X Sherman) at 11:00am; and THE RETURN OF THE WHISTLER (1948, directed by Ross Lederman) at 12:15. All but the final title star Richard Dix, who plays a different role in each, sometimes delivering work on par with his excellent portrayal of Captain Will Stone in Val Lewton's THE GHOST SHIP (1943). 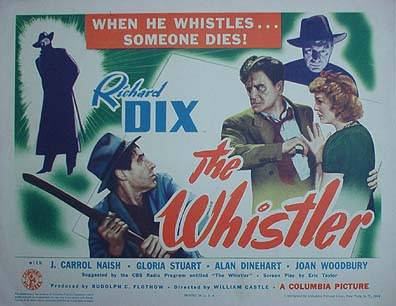 Missing from the lineup are one of the series' highlights, THE MARK OF THE WHISTLER (1944, directed by Castle and based on Woolrich's story "Dormant Account"), and THE THIRTEENTH HOUR (1947, directed by William Clemens), Dix's final appearance in the franchise. A victim of serial heart ailments, he died in 1949 at the age of 56. Some of us have been looking forward to this day since TCM started running pictures from their newly acquired Columbia film package back in January. For newcomers to the subject, there's a nice Wikipedia entry on "The Whistler" that you can read here. I also once posted some notes on the series here at Video WatchBlog. Prospective buyers of Sony's Blu-ray release SPIDER-MAN - THE HIGH DEFINITION TRILOGY (or their individual packaging of SPIDER-MAN 3 in Blu-ray) should be aware -- as I wasn't -- that the LG BH100 Hybrid Blu-ray/HD player is not presently set up to accept these discs. 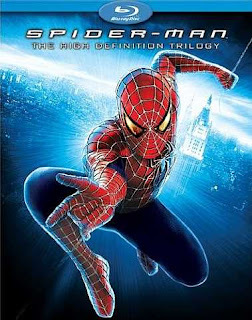 I was alerted to the problem last night, when I loaded SPIDER-MAN 3 into my LG BH100 only to discover that the animated menu screens looked sluggish and my remote control powerless to navigate the screen options or to access the movie. I reloaded the player with SPIDER-MAN 2 and experienced the same problem. Having accidentally ordered two copies of the set from Amazon.com, I decided to unwrap the set I plan to return, assuming that the first set was a defective pressing... but the discs in the second set wouldn't play either. Online perusal has turned up this thread on the AV Science Forum, which explains that this is a firmware problem and that LG is working on a solution. PS: Donna and I were able to use the link to download a firmware update which, burned to disc, was able to effect changes to our LG BH100 that allowed SPIDER-MAN 3 to play. Evidently these changes may also affect the unit's audio performance, but LG has promised an update to the update by the middle of the month that should correct this residual fault. I received an e-mail today from an acquaintence informing me that his blog had been nominated in one of the categories of The 2007 Weblog Awards and asking for my vote. I had never heard of the Weblog Awards before, but, as a fellow blogger, the notion certainly caught my interest. I followed the link to look over the nominees and categories and couldn't believe what I found. This award, which aspires at least by name to represent weblogs as a whole, has no Film category. Their Video category pertains only to blogs that show videos. They do offer a Culture category, under which I found only two film-related nominees: Kyle Smith Online (blog of the film critic for THE NEW YORK POST -- which, as often as not, exists to link to his reviews on the NYP site) and Self-Styled Siren (10 posts since August 20, one of them entitled "The Siren is a Finalist for the 2007 Weblog Awards"). There are also ten sub-categories nominating the "Best of the Rest" culling additional nominees from the "Top 8,751+ blogs." Video WatchBlog is not among them, and I honestly don't know which implication is more sobering: that Video WatchBlog literally isn't in the "Top 8,751+" blogs or that it's not generally considered among the best of those Top 8,751 plus. Sour grapes? I'll admit to one or two, because I take my work on this blog as seriously as I take any work that I do, but what I'm mostly feeling is bemused... by this award's concept of excellence. I speak not only on behalf of Video WatchBlog; not one of the several blogs that constitute my own daily bread, not one of the three upon which I bestowed the Thoughtful Blogger Award, are represented on these polls either. It's kind of like the Grammys, all over again. Forgive me for taking a personal communication public, but I don't know how to reach you privately. I know that today is your 80th birthday and I cannot let the day pass without somehow taking this opportunity to tell you how much your work has meant to me, ever since my own years were in single digits. I know that I must have first become acquainted with your work as an artist on monster comics like Charlton's GORGO and KONGA, but I only became devoted to it, as so many others did, with your work on THE AMAZING SPIDER-MAN. 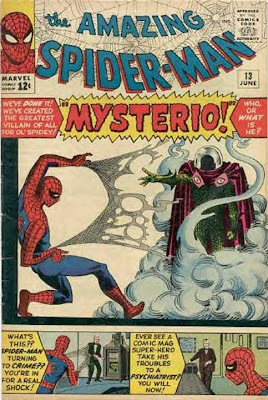 I began collecting it with #13, the introduction of Mysterio -- who, in a Spider-Man novel (THE GATHERING OF THE SINISTER SIX) later written by Adam-Troy Castro, was revealed to be a reader of my magazine, VIDEO WATCHDOG. There remains something about the covers you did for #13 and 14 (which introduced the Green Goblin) that exert a tremendous pull on my imagination. The Green Goblin was never a more frightening apparition than on the cover of his debut issue, his evil somehow all the more accentuated by the accompanying blurb "Do you think he's cute? Does he make you want to smile?" And Mysterio seems to me, of all your costumed villains, the perfect distillation of your talents into a single figure. I've always suspected that you drew heavily on the horror and science fiction and fantasy films of the 1950s and early '60s for inspiration, and in the smoke-encircled aspect of Mysterio, I've always detected a hint of Mario Bava -- the cinema's master of smoke and mirrors. It made perfect sense to me that, in his later incarnations, after you left the book, Mysterio was identified or reinvented as a former special effects technician; it was consistent with your vision and with the Bava connection. Anyway, I am certain that meeting your work with that Mysterio cover played a part in defining me as Bava's biographer, years before I actually saw his work. Your art planted the seed of my response to movies like PLANET OF THE VAMPIRES and HERCULES IN THE HAUNTED WORLD. Your work on THE AMAZING SPIDER-MAN #33 ("The Final Chapter!") and the first SPIDER-MAN ANNUAL, with its splash pages for each of Spidey's encounters with the separate members of the Sinister Six, are rightly celebrated as highlights of your tenure at Marvel. 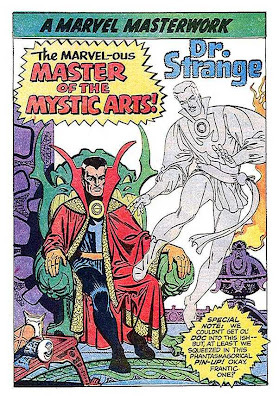 Now I regard the DOCTOR STRANGE comics you drew as the apex of your achievement. 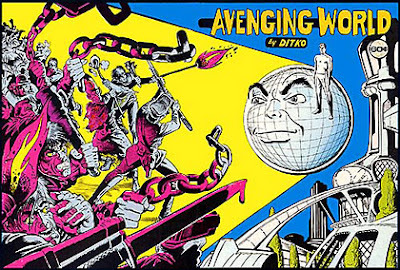 As a child, those comics a bit over my head in terms of narrative, but I spent many hours perusing them and trying to make sense of the mind-boggling tableaux therein. As I've said before, I consider it one of the great losses to 20th century cinema that Mario Bava never adapted your DOCTOR STRANGE to the screen. I was very disappointed when you left Marvel -- John Romita did a fine job, distinctive in its own right, but I've always had grave doubts that Spider-Man would have been able to survive that creative divorce without the ruthless hook of the dual unmasking of Spider-Man and the Green Goblin in #39 (possibly the most eventful single issue of a comic in history). When I next discovered your work, I seem to remember it was on the cover of a Charlton comic, probably your work on CAPTAIN ATOM or THE BLUE BEETLE. This discovery marked an important event in my development as an art lover: you were the first artist whose work I was able to identify by sight, by the personality of your art, rather than by signature. 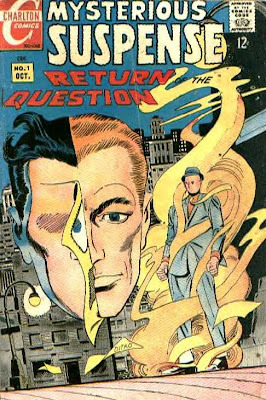 I can remember buying comics featuring your cover art, assuming that you drew the inside stories as well, only to be disappointed when you drew nothing inside or perhaps only a four-page story -- but there was never any question of not buying those comics; I had to buy them, if only for the cover. I had the same joyous experience when I found the first issues of MYSTERIOUS SUSPENSE, BEWARE THE CREEPER, and THE HAWK AND THE DOVE on the newsstand at my local five-and-dime. Those covers continue to hold a high rank on my personal list of your favorite covers, which also include some of your earliest work for the covers of SPACE ADVENTURES and THE THING. 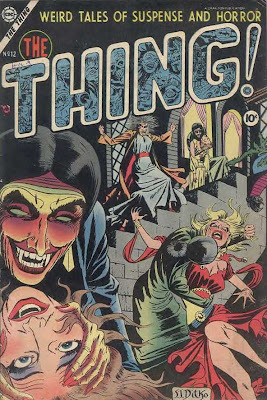 Suffice to say, anytime I came home with a new Ditko comic in the bag was cause for celebration, and my excitement would jolt even higher when I bought a new comic like T.H.U.N.D.E.R. AGENTS, brought it home, and found some new masterpiece by you buried inside. After more than 40 years of pondering the question, I find myself no closer to an understanding of why I respond to your work so profoundly. I know that some art appeals to us by virtue of its technical mastery, its proximity to subject, while other art appeals to us through the emotion invested in it. Frankly, and this is certainly no criticism, I can't say that either qualification applies to your work. However, I also believe that there is art that appeals to us because it comes to us from out of nowhere, without precedent, and stands before us as something perfect and individualized. We gawk at it because we cannot fathom its origin or manner of execution. It did not exist before, yet we cannot un-imagine it; it needs to exist and fills a suddenly obvious gap, not only in the place it occupies in the history of art, but in the uncharted terrain of our collective imagination. This is ultimately the final explanation I can offer for your work's unique appeal. It is also my definition of genius. I also want you to know that you've been an inspiration to me above and beyond what you have achieved in your art, and I say this as a great admirer of some of your most controversial work, such as THE AVENGING WORLD (a particular favorite). If the select group of men and women I have chosen as my personal heroes have anything in common, I've usually found out that the maverick stance of their art is a reflection of the maverick stance they have taken in life, and you are surely one of these. Like many other of my heroes, including Bava, you have pursued life as an artisan rather than as an artist, which has resulted in a life of work rather than what one might characterize as a "career." You have willfully chosen to take a more difficult and challenging path through your profession by shunning publicity and remaining true to your core ethics concerning life and business. Your brave and admirably stubborn example has helped me to see that there are more (and more rewarding) ways to spend our time in this world than placing ego before ability and becoming hellbent on success at any cost. Because I know nothing about your personal life, I can only hope that your dedication to your ethic and philosophy has not been entirely solitary and that you have known much personal happiness. This is my birthday wish to you, because your work has brought me, and so many others, so much happiness over the years. MARIO BAVA ALL THE COLORS OF THE DARK is "Now Playing" in Gotham City! 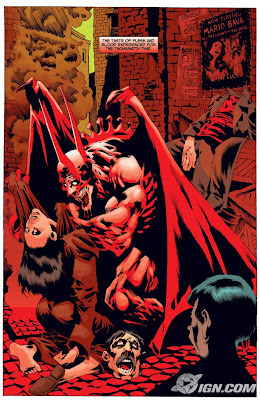 Artist Kelley Jones inserts my new book into the most traumatic moment of his latest Dark Knightmare, "Batman Bloodlust" -- one of thirteen all-new terror tales in the premiere issue of DC Comics' INFINITE HALLOWEEN. Get the whole story on the Bava book blog.